We are very fortunate in our little part of the world to have some of the most accomplished creators/purveyors of essential consumable products that allow us, along with our friends and family, to experience simple pleasures in our every day lives. In addition to a bevy of excellent restaurants in our town, we have a superb bakery in Charleston Bread, outstanding access to fresh seafood at Joe’s Fish Market, hand cut fresh meats at Johnnie’s in the Capitol Market and several fine wine shops including Kroger’s Ashton Place, the Wine Shop at Capitol Market and the fine sippers available at Drug Emporium. And this time of year, we have access to world-class, homegrown vegetables at the amazing outdoor Capitol Farmer’s Market. A literal cornucopia of locally grown goodies, I graze almost daily through the aisles and stalls, selecting fresh vegetables for the dinner table. 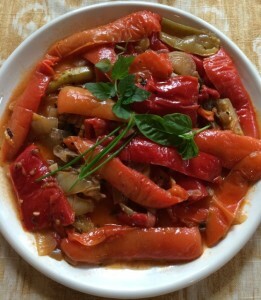 Today, I am going to share with you my recipe for “Fried Peppers Calabraze. ” This nostalgic dish brings back fond memories of my Calabrian grandmother frying peppers just picked from the garden and placed on slices of hard-crust Italian bread. The bread, freshly baked and still warm, came from our family bakery just across the street. The beauty of the recipe is that you can adjust it to accommodate your tolerance for spiciness. Since you will choose how many – if any – hot peppers to use in the dish, you can control the heat. 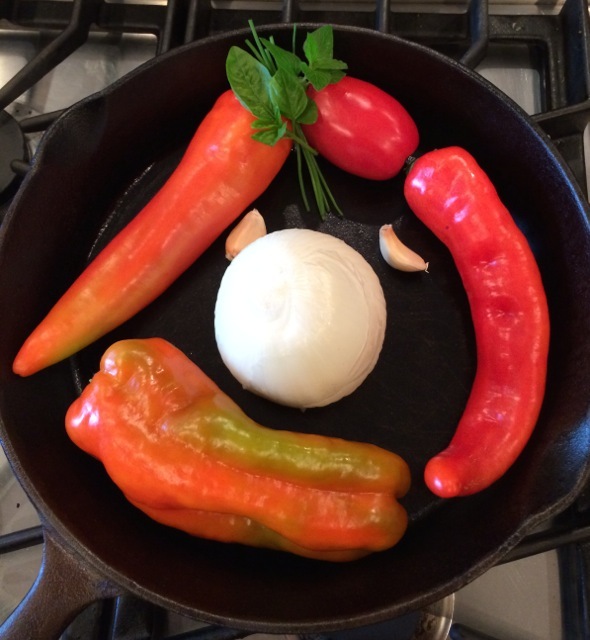 I use Hungarian wax peppers which range in color from light green to red and which approximate the heat of a jalapeno. For the sweet (non-hot) peppers, I use red, green, yellow and orange bell peppers. You may also use sweet Hungarian Wax peppers which have the same flavor as their spicy cousins, but without the heat. This fried pepper recipe can serve as a spicy accompaniment to any meat or fish dish, and makes a sensational sandwich when heaped on slices of baguette or ciabatta from Charleston Bread. And of course, I’ll also give you suggestions for a couple of wines that pair nicely with the dish. This dish needs a wine that can stand up to the spiciness of the peppers. My choices are a sparkling wine from Argentina and an Italian Valpolicella. Reginato Rose of Malbec NV ($15) – What a nice surprise! Lovely strawberry and cherry flavors highlight this crisp and dry sparkler from Argentina made from malbec. Not only stands up to and complements the peppers, but also adds a thirst quenching component to the whole equation. 2013 Allegrini Valpolicella Classico (16)- Bright red and full of black cherry flavors, this wine from the Veneto in northern Italy is a medium-bodied wine with a smooth texture and good balance. Refreshing with just enough body to pair well with the peppers and cool the spiciness just a bit. Serve it slightly chilled.